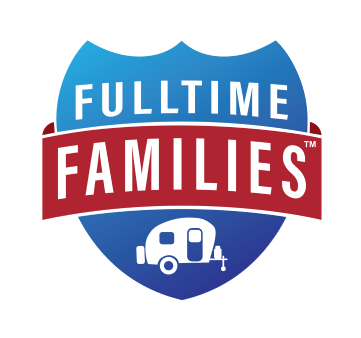 Are you getting ready to attend your first Fulltime Families Rally? Or, are you thinking of signing up for one but do not know what to expect? 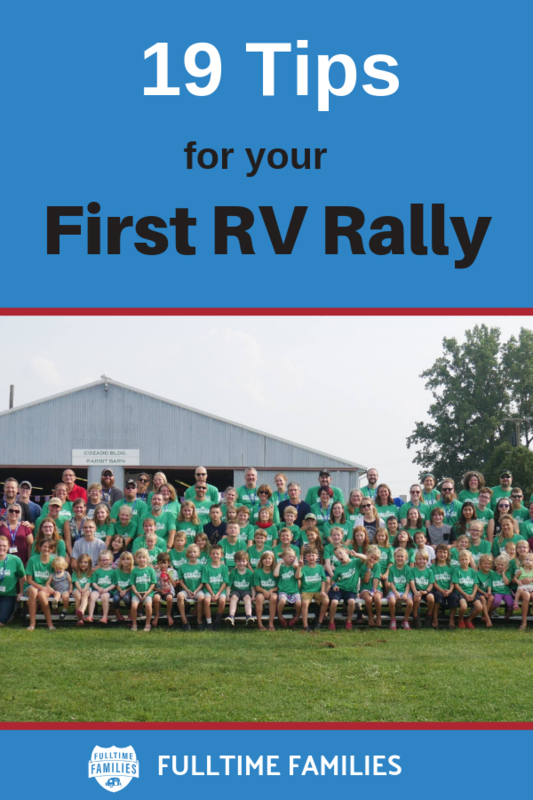 Our full-time RV living and traveling family of 6 just attended our first rally and had the time of our lives! Yet, we didn’t quite know what to expect. So, I wanted to help you get a jumpstart and share with you 19 ways to be prepared for your first Fulltime Families Rally. 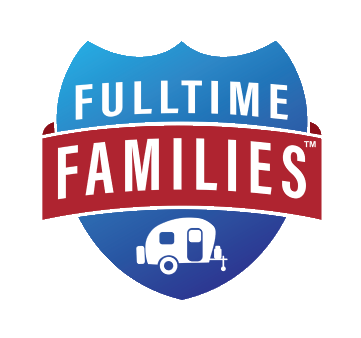 If you haven’t joined Fulltime Families, learn more here about how you can become a member and receive access to the Fulltime Families rallies and events! 1. Join the Facebook group specific to the rally you will be attending. If you use Facebook regularly, you will most likely see there is a Fulltime Families public page, a Fulltime Families Members page, and several other smaller groups and topics. Yet, if you are like friends of ours and choose not to use Facebook at all, then you will miss out on a wealth of helpful information before the rally. So, I suggest setting up a Facebook account and joining the specific group to the rally you will be attending such as ‘Fulltime Families 2018 Under the Sea Rally Attendees’. 2. Book camping at the location of the rally for at least a few days BEFORE the start of the rally and at least 1-2 days AFTER the rally ends. We did not do this and missed out on opportunities to meet people before the rally began. You see, once it begins there are so many amazing things on the schedule that there isn’t a whole lot of ‘down’ time to just hang. If you want that opportunity, then I suggest arriving early and staying later as some families do. 3. Take off work for the entire rally! Whether you work a 9-5 job remotely, are still looking for creative ways to make money online while traveling, or you are an entrepreneur and can set your own schedule, I suggest that ALL parents take time off work during ALL the rally days. Not only is it worth it for everyone to participate in the amazing events, but it can also get a bit hectic with the kiddos. Having an extra set of hands from a second parent, if available, will make your experience less stressful and so much more fulfilling. 4. Make meals ahead of time and freeze them. You will be very busy with events, activities, games, campfires, coffee talks and more during the rally. Or, you may find a new family that you want to talk with for a bit longer than it gives you to make a meal. This leaves little time to do things such as cook, do dishes, clean up, etc. So, think of quick and easy meals that you can have each day, or make some things ahead of time and freeze them. We had chili and chicken tikka masala in our freezer ready to go and I was so glad that we did! 5. Buy paper products and snacks ahead of time. Stock up on paper products to help decrease how much time you need to spend doing dishes. Also, do a quick Costco run to bulk up on produce or snacks that are easy to grab and leave little mess. Life can get so busy, in an exciting way, that you are not going to want to have to run to the grocery store while at the rally. 6. Take a week off your homeschooling, worldschooling, roadschooling etc. All the families that I spoke to at the Madison, FL rally took the week ‘off’ of school to enjoy themselves. There just isn’t time and the kids are learning so much anyway. From great social skills to arts and crafts, the kids learn a great deal at the Fulltime Families rallies. 7. Use radios, walkie-talkies, watches or cell phones for the kids – Or be ready to follow them everywhere. During rally-time, there are many opportunities for kids to run off and play together. 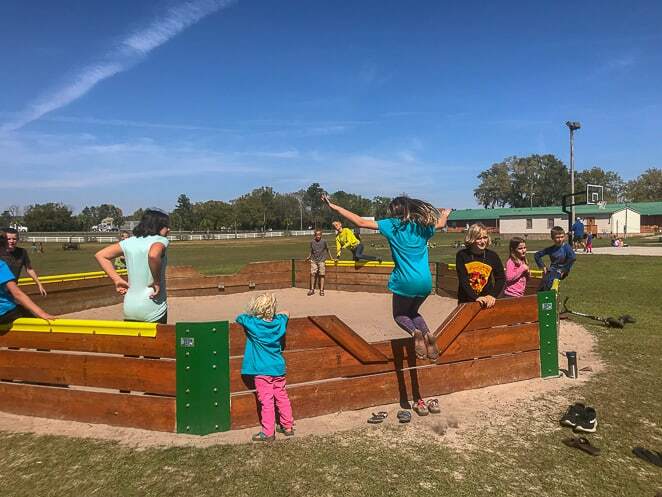 From hanging at the playground to playing a game in the field to playing Legos together at a picnic table, they will be busy playing if there isn’t a planned activity. We used walkie-talkie radios to keep track of our 9 -year old while we were at the rally. Having 4 kids with different ideas of fun things they want to do can sometimes be a bit challenging, so we found our radios very helpful. When our son wanted to play Ga-Ga ball and I wanted to attend a coffee talk about Kombucha, my husband stayed with the girls while they did a craft at the back of the coffee talk room and held a radio to listen in if Riley needed anything at Ga-Ga ball. Another great option is to purchase one of the several watches you can get for your children that connect to your cell phone. I saw several children wearing the watches at the rally. Those would have been really helpful too! 8. Increase vitamin C and probiotics – Boost those immune systems. 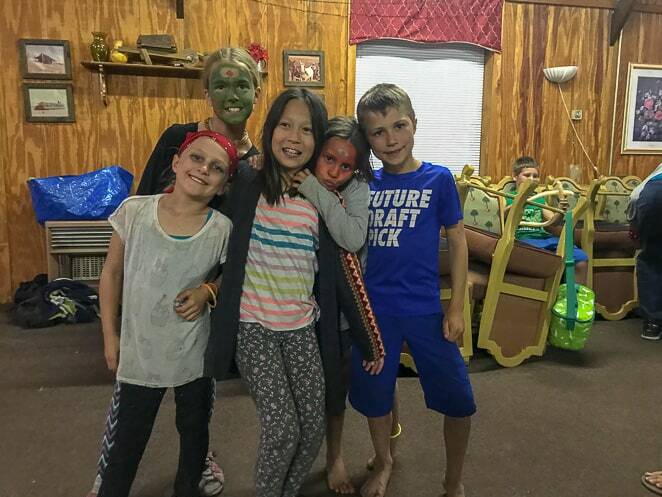 Late night campfires, all day of running around, swimming until their lips are blue, and eating foods at the potlucks that we are not accustomed to make me so thankful that we decided to boost our immune systems before we arrived. Extra vitamin C such as Elderberry syrup or Vitamin C powder mixed into a spoonful of honey is the way our family supplements with vitamin C. We also drink kombucha daily. I know there are many other ways to do what works for your family to help everyone stay healthy during a fun week at the rally. 9. Adult Marketplace – Think about participating! I loved attending the adult marketplace at the rally. I visited tables from other traveling parents with goods and services such as essential oils, cupcakes, cleaning products, jewelry, and marriage and family coaching. It was a great way to connect with other fulltime family members and show each entrepreneur support. Do not hesitate to participate if it’s your first rally. It’s a great way to market your goods and services and make those connections I keep talking about. 10. 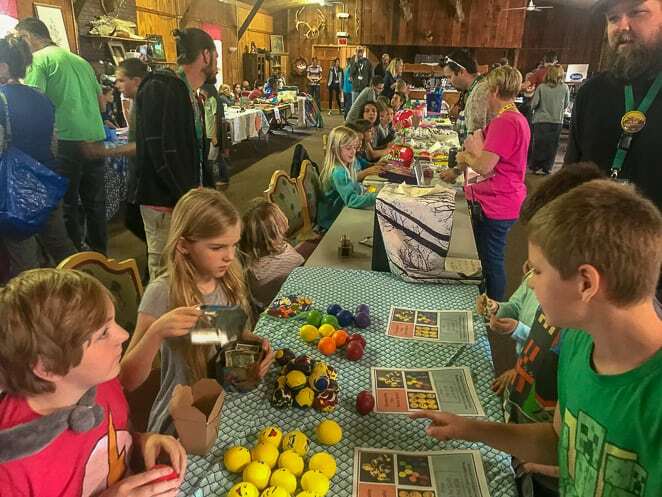 There’s a Kid’s Marketplace too – Get creative and think ahead. We had no idea what to expect with a kids marketplace. Wow, it was a huge turnout of children selling their goods! Anything from homemade jewelry and cookies to selling their toys or painting your nails for you. Be creative and get involved if this is offered at your next rally. The kids LOVED the marketplace and talked about it well after it was over. 11. Save your ‘giveaway’ items to include in the Swap table. Do you often go through your RV with a plastic bag grabbing things left and right getting ready for a Goodwill donations run, or is that just me? Living in such a small place we all know that we need to purge quite often. Yet, it sure is nice to find the next size up in jeans for your kiddo or a new screen door handle for your RV door. The Swap table is set up one day of the rally for everyone to bring things to contribute and take things as they like or need. It’s a great way to help a friend out and find something that you may not have been able to find during your last shopping run. 12. Attend the coffee talks – You learn so much! The coffee talks were a great time for adults to get together and listen to a fellow fulltime family parent speak on a topic of interest. From talks about making Kombucha to tips on keeping a marriage strong while traveling fulltime, I walked away from each coffee talk with so much more knowledge than I expected. 13. Potluck – be ready to contribute if you want to. Look on the Facebook page or watch for a message to be sent your way from Fulltime Families about what to pack and bring to the rally for the potluck dinner. They usually assign you to a potluck group so that you can plan what meal you will contribute. Everyone does their best to help accommodate food allergies and preferences too. I found it SO helpful when I was speaking to an adult and he or she had a nametag on. You will be meeting so many new faces that it can be embarrassing when you forget their name. Yet, if they have a name tag on you are golden. Also, you will earn rally cash if you are caught wearing your nametag! Rally cash is used on the last night of the rally to put into the raffle drawing for awesome prizes. 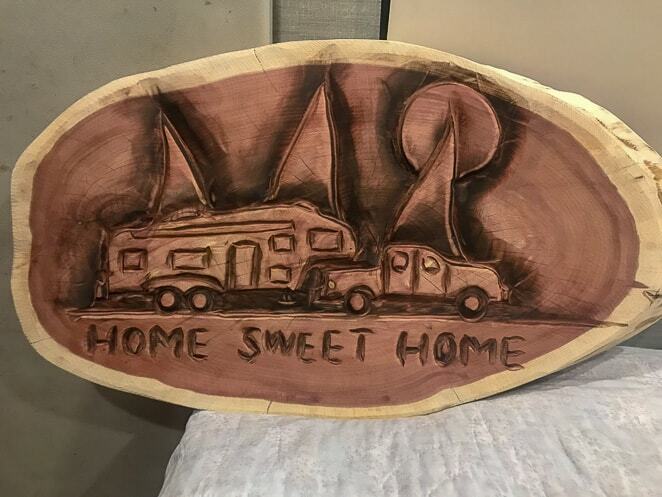 The prizes included children’s toys, essential oils, free camping passes to campgrounds, discount on Fulltime Families memberships, and donated items such as the chainsaw art that we won at the rally in Madison, FL!! Rally cash is given out to adults and children throughout the entire rally for all sorts of good deeds. If you wear your nametag, help clean up, volunteer, or just overall do a good deed then you will earn some rally cash! You then put your family’s last name on the back of each ticket before arriving at the raffle to put the tickets (cash) into the different drawings. Many families work hard to earn their rally cash and a lot of kids get really into it. 16. Enjoy the dance and feel free to dress up! Along with the raffle, there is a dance the last night of each rally. Many kids and adults dress up to follow the theme of the rally. Feel free to brainstorm fun ways to get all glammed up, or just come as you are ready to dance. Just be aware that the evening can run long for the little ones and you may not be able to stay to the end of the dance if they woke up early that day ready to play as mine did. 17. Be flexible with bedtimes at the Fulltime Families Rally. This one was hard for us, as our kids really were wiped out and ASKED to go back to the RV so they could go to bed by 8:30 most nights! The days are packed full of fun and excitement, so I totally understood. Yet, it was hard on us parents who were looking forward to the bonfire conversations that evening. My husband Tony and I took turns going back with the little ones so the other could stay out a bit longer to visit with the other adults. However, if your kids can keep going then I suggest pushing the bedtime and staying out to socialize. Make connections with other families so that you can plan to meet up again down the road! 18. Plan for a lot of visiting time with new friends. If you are an introvert, it’s okay. Just know that we extroverts will be open to walking up and introducing ourselves at your picnic table to start up a conversation. 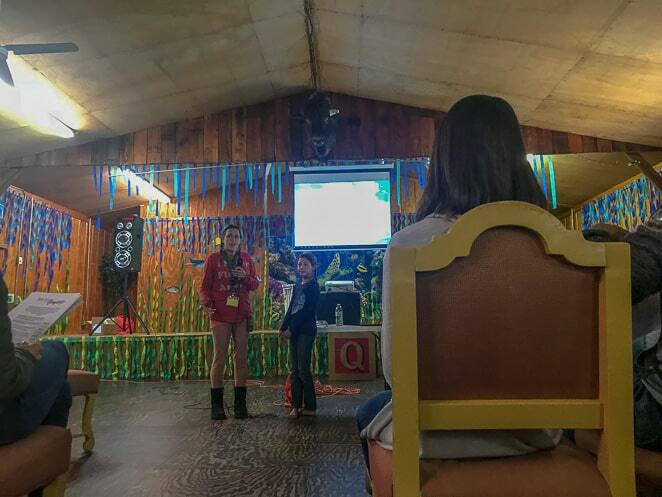 ☺ Rally-time is a time to meet new friends, reconnect with old friends, learn together, and grow those connections with other families that are SO much more like us than we realize. 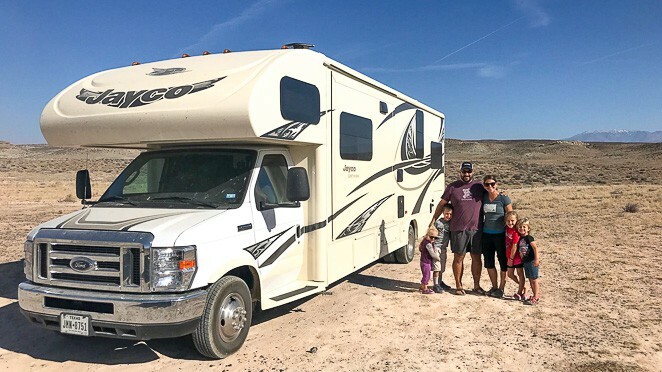 We may live in different priced or sized rigs and have different religious or political beliefs, but we all understand what life is like living in an RV with kids. We are all fulltime families and it’s SO great to connect with others who just ‘get you’. Pro Tip: It’s okay to let your RV be off-limits to visitors inside. If you need a ‘sanctuary’ to go cool off for 30 minutes, then take it. Do not sweat about a messy home. We ALL have messy homes, especially during rally week. 19. Parade of Homes – you can participate but don’t feel obligated! 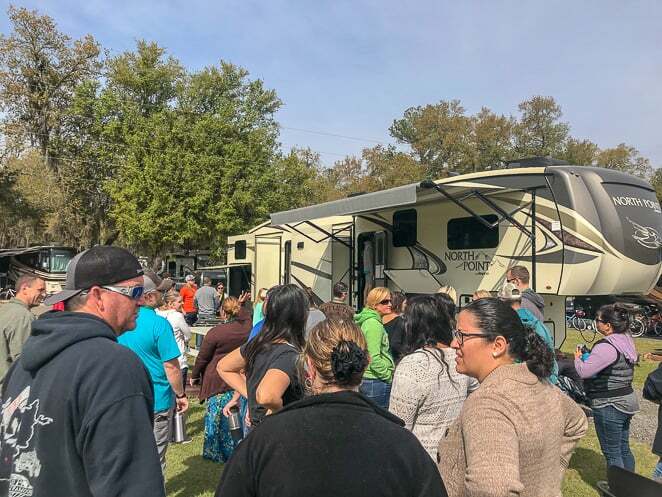 The parade of homes is an opportunity to show off your rig and help inspire other families with ideas on fun RV hacks and remodeling tips. It’s also a great time to NOT show off your home, but instead just walk through other’s knowing that yours is a hot mess. If you don’t feel up to keeping a tidy place ready to show, then don’t sweat it. Just know that we are all curious as everyone’s rig is set up a bit differently for a family. From homeschool areas to kitchen setups, to custom made bunk beds, it’s fun to see what others do to their rigs. Fulltime Families Rally – Here I Come! If you haven’t experienced a Fulltime Families rally, I hope my tips will help you to decide to do so. You will drive away feeling so glad that you did! Be ready to meet some great people and build some amazing friendships. Feel free to connect with me, Jill Greising-Murschel, at Let’s Travel Family if you have any questions or have any concerns that I did not touch on here. I’d be happy to help! Or, connect with us on Facebook, Instagram, Pinterest or Twitter.